"Our team will stay for as long as necessary. This is part of our show of support to the people of New Zealand during this difficult period." Mr K Shanmugam, Singapore's Minister for Home Affairs and Law. The Singapore Civil Defence Force (SCDF) has shared the following images of its Urban Search and Rescue (USAR) team now deployed in Christchurch to assist New Zealand authorities with quake relief operations. 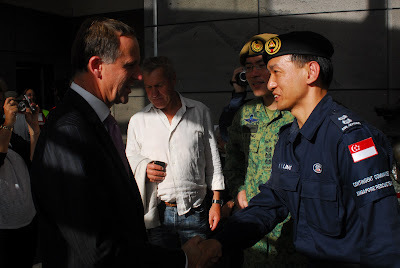 Singapore has sent 55 SCDF officers and four search dogs to New Zealand under the banner of Operations Lion Heart. The contingent commander for Ops Lion Heart is Lieutenant Colonel Ling Kok Yong, who is Commander of the 1st Civil Defence Division. Based at Alexandra Fire Station, the 1st CD Division provides emergency response coverage for the southern parts of Singapore. The team includes members of the SCDF Disaster Assistance and Rescue Team (DART), which is the SCDF's crack rescue team, as well as SCDF officers trained, organised and supported for USAR work under demanding conditions. 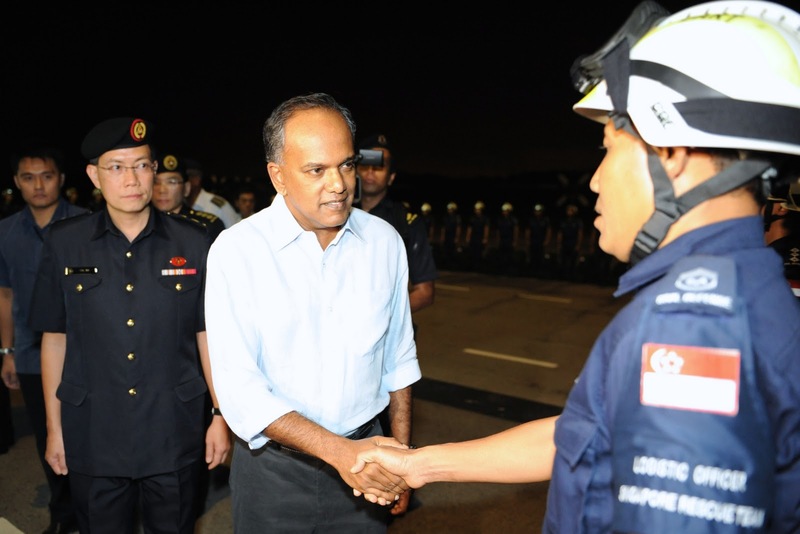 Mr K Shanmugam, Singapore's Minister for Home Affairs and Law, said on Wednesday: "We are all deeply saddened at the loss of so many lives and the scale of the destruction. We are sending our SCDF officers including the DART Team to New Zealand to help - to rescue lives and help in the post-disaster relief efforts. The SCDF team has the experience, and the necessary equipment for the task. They will work with the NZ authorities and be deployed where assigned or needed." All images courtesy of HQ SCDF. The assistance of the SCDF Public Affairs Department is appreciated. Send off: Mr K Shanmugam, Singapore's Minister for Home Affairs and Law and Assistant Commissioner (AC) Eric Yap, Acting Commissioner SCDF, were at Paya Lebar Air Base to send off the Lion Heart contingent. The SCDF Urban Search and Rescue (USAR) team, codenamed Operation Lion Heart, were airlifted to New Zealand in two waves. Life savers: A Singapore Civil Defence Force (SCDF) Urban Search and Rescue (USAR) team made up of an SCDF rescuer and his search dog comb the debris of a building along Gloucester Street, about 1km west of the SCDF's base camp at Latimer Square in Christchurch. This picture was taken around 7pm, Singapore time, on 23 Feb 2011. Protect and save: SCDF rescuers use the keen sense of smell of various breeds of dogs to detect signs of life in debris fields. Four SCDF search dogs are in Christchurch as part of the 55-member SCDF Operation Lion Heart USAR team. The danger of falling debris from aftershocks which rock the city occasionally is evident in this picture. Hand of friendship: Prime Minister of New Zealand, Mr John Key briefly spoke to Lieutenant Colonel Ling Kok Yong, the Singapore Civil Defence Force (SCDF) Commander of the Urban Search and Rescue (USAR) Contingent during his visit to the Christchurch Art Gallery, which is now converted to a Crisis Management Centre. The New Zealand PM was briefed on Singapore's contribution to the quake relief effort and met some of the rescuers deployed to NZ.